Welcome to Plum-IT Services, we are a Plumbing, Heating and Renewables company located near Marlborough, Pewsey and Hungerford. Plum-It services cover North Wiltshire, West Berkshire and Hampshire and provide a complete, professional one-stop shop for Plumbing, Heating and Renewable Services. 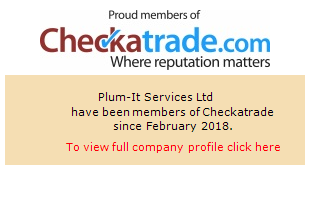 We are fully registered on Checkatrade.com for clients' peace of mind, why not visit our page. Our pricing is extremely competitive and we provide a 12-month guarantee on any job undertaken. Please call us for today to arrange for us to visit you to assess the work you require and to provide a free no-obligation quote. All modern condensing oil fired systems installed, maintained and serviced as part of our long term commitment to our customers. We will send you a reminder when your system is due for service. We install all major manufacturers oil fired boiler systems. Unvented (Pressurised) Hot Water Systems.